He covered her bdy with his, and as she put her arms around him she could picture him in all his incarnations: age five, and still blonde; age eleven, sprouting; age thirteen, with the hands of a man. 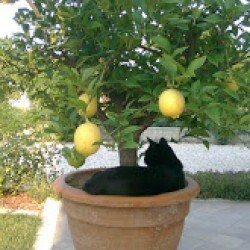 The moon rolled, sloe-eyed in the night sky; and she breathed in the scent of his skin. "I love you," she said. 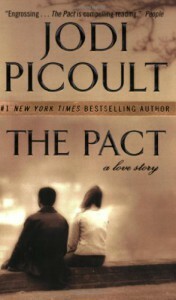 I received a copy of Jodi Picoult's The Pact from Sher as a prize for my participation in Thursdays' Thoughts. Thank you, Sher, for sending me this book! It's one of Picoult's best novels about an apparent suicide pact between two teenagers, Chris and Emily. Chris Hart and Emily Gold have always been inseparable. Their parents have been friends and next-door neighbours for eighteen years, and now the two seventeen-year-olds are dating, like their parents wished them to be. Chris is a talented swimmer, while Emily is a promising painter. So when midnight calls from the hospital come in, no one is ready for the appalling truth: Emily is dead from a gunshot wound to the head. There's a single unspent bullet in the gun that Chris took from his father's cabinet-- a bullet that Chris tells police he intended for himself. But a local detective has doubts about the suicide pact that Chris has described, and Chris is arrested with the charge of first-grade murder. The thing I like best in Jodi Picoult's novel is that they always ask powerful questions about family, life, and love. The thing I like the least in her novels is that they're always full of legal jargon that I find it difficult to understand. In this book, like in many others from Picoult, there's a trial at the centre of the narrative: the trial that will decide whether Chris is guilty of his girlfriend's murder. I found The Pact an engrossing read. The characters are well-depicted and feel real. The narrative frame is ingeniously built, with frequent flashbacks between "Now" (after the shot) and "Then" (before the shot). I liked this book very much, and would recommend it.